There’s a new hero in town and he’s zapping onto Disney XD Canada this March to star in the hilarious adventure series Penn Zero: Part-Time Hero. Premiering Monday, March 16 at 6 p.m. ET, the animated comedy stars BC-native Thomas Middleditch (Silicon Valley) as the titular character and follows Penn and his friends as they zap to other dimensions to fill in for heroes in need. The side-splitting show headlines Disney XD’s Massive March Break lineup, a can’t-miss programming event running from Monday, March 16 – Sunday, March 22. Penn Zero just inherited the coolest part-time job ever – he’s a superhero and leader of a ragtag team of good guys with interdimensional zapping powers. Every day after school, Penn and his best friends Sashi (Tania Gunadi, Enlisted) and Boone (Adam Devine, Pitch Perfect), battle the evil part-time villain Rippen (Alfred Molina, Spider-Man 2) and his minion, Larry (Larry Wilmore, The Nightly Show with Larry Wilmore), in an attempt to save another world. Whether he’s transformed into a superhero, fish-prince, clown cop, giant monster or tiny action-figure, Penn uses his unconventional heroic skills to save the day in his own way. Throughout March Break, new episodes of the laugh-out-loud comedy will air every weeknight at 6 p.m. ET, immediately following a massive marathon from one of the network’s top series. Disney XD’s Massive March Break lineup officially kicks off on Monday, March 16 with back-to-back episodes from fan-favourite series airing each week day beginning at 3 p.m. ET. The marathon madness showcases only the most awesome episodes from Lab Rats, Pac-Man and the Ghostly Adventures, Mighty Med and Kirby Buckets and features a brand new episode daily at 5:30 p.m. ET. Delivering a jolt of power to the weekend, the non-stop week continues with a sensational Super Charged Sunday on March 22. The adrenaline-fueled evening kicks off at 6:30 p.m. ET with a brand new episode of Gravity Falls followed by the highly anticipated series finale of Kickin’ It. In the final episode, titled “The Grandmaster,” Sensei Rudy receives an irresistible offer to fulfill his lifelong dream of practicing karate in Japan – but can he bear to leave his Wasabi Warriors behind? Then, at 7:30 p.m. ET, in the season three finale of Lab Rats, Spin – a bionic soldier – tries to prove himself as a leader by taking off on a rogue mission. Fans looking for even more to do this March Break can check out DisneyXD.ca to dive deeper into the wonderfully wacky worlds of their favourite shows with exclusive video content and cool games. Plus, fans can put their creativity to the test by entering the “Star Wars Rebels Celebration Contest” where they can submit their very own Storm Trooper Helmet designs and then vote on their favourites for the chance to win a trip to the upcoming Star Wars Celebration in Anaheim, California. The website also features a Penn Zero: Part-Time Hero dedicated show page where kids can learn more about the series and its characters. In addition to the series regular cast, Penn Zero: Part-Time Hero stars the voices of Lea Thompson (Back to the Future) as Penn’s mom, Vonnie; Gary Cole (Veep) as Penn’s dad, Brock; Rosie Perez (The View) as Penn’s Aunt, Rose; and Lenny Venito (The Neighbors) as Penn’s Uncle, Chuck. The series also welcomes a super-heroic roster of guest stars including: Garry Marshall (Happy Days), Beau Bridges (The Millers), Sigourney Weaver (Avatar), Sean Astin (Lord of the Rings), Wanda Sykes (The New Adventures of Old Christine), Jason Alexander (Seinfeld), Diana Rigg (Game of Thrones), Adam West (Batman), Olivia Holt (I Didn’t Do It) and NASCAR driver Jeff Gordon. 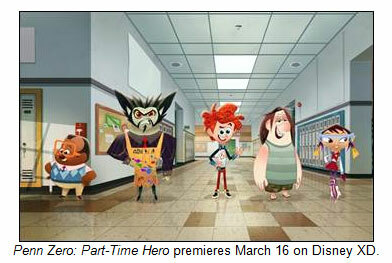 Penn Zero: Part-Time Hero is created and executive-produced by Jared Bush (All of Us, Zootopia) and Sam Levine (Tarzan, Bolt) and produced by Disney Television Animation. Bush also serves as writer and Levine as supervising director and the voice of Phyllis and Phil. This entry was posted on Thursday, March 5th, 2015 at 7:31 am and is filed under National News. You can follow any responses to this entry through the RSS 2.0 feed. You can leave a response, or trackback from your own site.